How many of you believe everything that you see on TV? What about everything that you read in the newspaper? What about everything that you read online? Because if it’s on the internet, that makes it true doesn’t it? How many of you believe what is written in the Bible? What do you spend more time on – reading the Bible, or reading Facebook? We believe that the Bible is true – we state that in our doctrines, right at the very beginning, our first doctrine: “We believe that the scriptures of the Old and New Testaments were given by inspiration of God and that they only constitute the divine rule of Christian Faith and practice.” We believe the scriptures to be true, we believe them to be the only source that can guide our faith and practice – yet how often do we read it? Some research out of the US in 2012 suggested that only 19% of Church going people read their bible daily. That’s roughly the same as those who responded that they rarely or never read the bible. On the other side of the equation, in Australia, in 2011-2012, Australian adults spent on average 13 hours per week watching TV. Add on an average of 6 hours a week using the computer or internet, and you’ve got nearly a day a week spent on activities that we know aren’t necessarily true. However, we do have an opportunity to change this. We can start reading our bible more, and start having the words written on our hearts so that we can start living it out in our daily lives. When we read the bible daily, it starts to shape us, so that more and more we start living out what we read in the bible. Now, the problem comes is that some people find the bible difficult to read. That’s because the bible isn’t like an ordinary book – we can’t just read it cover to cover like you would a novel. We need to read it differently. If you were to read it cover to cover – you could start off well. You get through Genesis, and there’s some great stories in there, ones we know well. There’s Adam and Eve. There’s Noah and the Flood. There’s Abraham, Isaac, Jacob and Joseph – all these great story lines that we know and love. We can even get through Exodus, with the calling of Moses and the burning bush, the 10 plagues, the crossing of the red sea. Again, great stories that can keep us going with our reading. And then we get to Leviticus. Now if you manage to work your way through Leviticus, you’re then hit with Numbers, which contains not one, but two massive census lists. Then when you think you’re almost through, you get Deuteronomy, which is effectively Leviticus part 2. And if you’re still going by then, you’re probably just a little bit odd – in which case you’re more than welcome here. However, if we’re to actually entertain some sense of sanity when we’re reading the bible, we need to take things a little bit differently. For most people who have never read the Bible before, I generally recommend that they start with the Gospel of Mark. It’s short, it tells the basics of Jesus’ story, and it’s very direct. From there, you can start fleshing things out – either with another Gospel – Matthew or Luke generally, then add in Acts, some Epistles, and maybe some of the prophetic literature to add in some of the background as to why Jesus was so important. But, unless you’ve done some sort of training, you won’t have the clues to pick up what is being said, and how it applies to your life. We need a little bit of help and guidance. When I first got started in reading the bible daily, I used this here. It’s a daily devotional commentary. This worked me through the entire bible in a year, with an overview of the passage, some notes on understanding the text, a personal devotion – which is someone’s reflection on that passage, a personal application, and a quote to add something else to it. I found it great – but it does work through the Bible cover to cover, so that may not work for you. 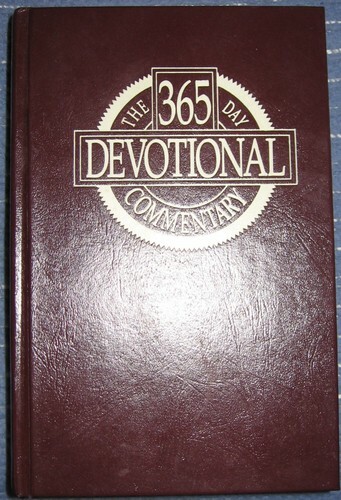 But there are many other devotions and commentaries available to help you in your reading. Our Daily Bread, Every Day with Jesus, The Upper Room, and many more. There are also methods for reading your Bible without any devotional aspect to it. These have a benefit of only getting what is actually in the Bible. These can come in the form of Bible Reading plans, check lists, or methods, such as Professor Grant Horner’s Bible-Reading System, where you read a chapter from each of the ten lists each day, which Professor Horner says will aid memorisation and bible knowledge when repeated over a long period of time. One method that I like is called lectio divina, and is one of the methods practiced by Benedictine Monks. It can be done in a variety of ways, but in essence it is a way of prayerfully reading the text, to see what God is saying to you, through that text, on that day. This focusses on much smaller amounts of text – a verse, or a phrase, but spends much more time reflecting upon it. We need to start reading the bible every day, and not just reading it because it’s what should be done. We need to read it, because we want God to make a change in our lives. We want these words to be written on our hearts, because if we don’t fill our hearts with good things, then it will be filled with things that are not of God. When we fill our hearts with the word of God, our actions will flow out of the word, and our actions will be noticed by those around us. And when people ask why, we will be able to tell them, because the why will be written on our heart. So today, commit to reading every day. Commit to letting the word live in your heart, to be written in your heart. Commit to the word being applicable to every part of your life. In 2015, The General has asked that all Salvationists surround the Congress with prayer and bible reading, by committing to read 1 chapter of the New Testament every day. While we will be doing that, and we’ll be doing something special for that as well, I say why should we wait until 2015 to do something that we should be doing every day! Kay Arthur said “When you know what God says, what He means, and how to put His truths into practice, you will be equipped for every circumstance of life.” Let’s commit today to learning what God says, what he means, and how to put his truths into practice, so that we can be prepared for anything that comes our way.